Monster Cloud Search is the most advanced way to match qualified job seekers with your opportunities and is now available to seamlessly integrate with your Bullhorn ATS and CRM software. Powered by Monster’s 6Sense® search technology, Monster Cloud Search helps you quickly pinpoint the ideal candidates within any of your databases. From within Bullhorn’s ATS environment, recruiters can access Monster’s 6Sense Semantic Search technology, streamlining their ability to access their current candidate database through Monster Cloud Search. 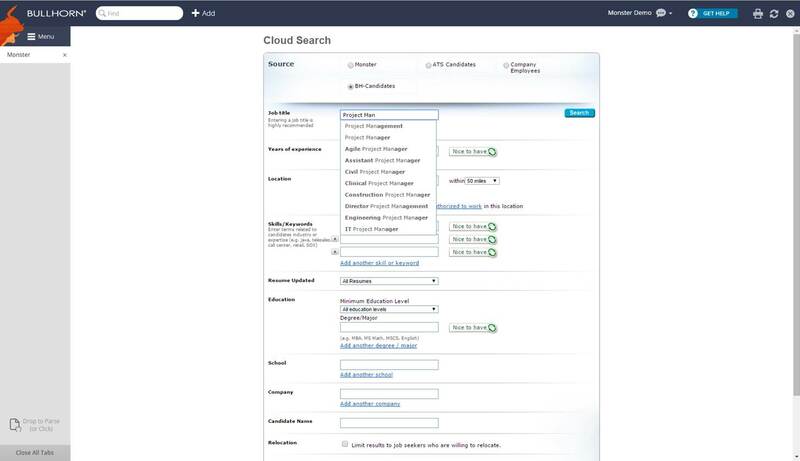 Monster’s Cloud Search allows recruiters to search all of their resumes via Monster’s 6Sense technology. With one click, recruiters can add candidates to tearsheets or import them directly into the Bullhorn ATS. Speed and efficiency are essential when filling positions in the staffing industry. It can take a staffing company days to identify the right candidate to fill one position; with Cloud Search, it takes just minutes, allowing recruiters to spend more time connecting jobs and candidates to drive more revenue.